HONG KONG, Apr 24, 2018 - (ACN Newswire) - International consumers are demanding bright, authentic and adventurous homewares, leading trendspotters reported to 2 trend seminars at this year's HKTDC Hong Kong Houseware Fair (20-23 April). They identified the colours, features and textures that will define the collections of 2019. The first seminar saw Lea Czermak, Senior Creative Project Manager for Paris-based trend-forecasting agency NellyRodi, identify four groups of consumers that dominate demand. The second seminar featured WGSN Senior Editor Anupreet Bhui, who presented four trends that drive product development. At the first seminar, entitled "Fascination NellyRodi Trends Spotting for Summer 19", Ms Czermak presented four concepts to inspire buyers, delivering a look book of products in varying colours, materials, shapes and moods. She said the agency's research had identified consumers that were eager to explore new solutions and built-in modularity in more functional and streamlined collections. "It's a really sunny and positive disposition that today's lifestyle proposes new decorative concepts and some new ideas to introduce to your home," she told the seminar. "We really need to bring out a new creativity and new opportunities to create some fascinating and inspiring new worlds and ideas." These social trends were linked to "four adventures" called Colonial Chic, Vital Vibe, Magnetic Mix and Super Solarium. Simplicity, nature and environmental concerns drive the Vital Vibe, a type of consumer that identified with a laid-back Californian vibe. "They enjoy taking their time and simplicity but they also want to experiment. You can imagine them in a laboratory... creating new solutions to protect the world," she said. These consumers would be keen to see products made of new resins and composite materials that were presented in natural colours, but also items crafted from sustainable sources, such as wood and cane that might be shaped by plaiting and weaving. Consumers inspired by a science-fiction-fuelled future - shiny, sleek and high-tech - fall into the Magnetic Mix category. "They want to find innovation everywhere and they want to experiment with new materials. They live in an extreme environment where they don't have any superfluous things around," she said. Buyers could tap into this market by delivering products that combined aesthetics and subtle technology, in modern textiles, sustainable plastics and creative shapes, in shades of green, blue and violet. Iridescence and pearlescence, chrome and frosted finishes, and pastel walls and surfaces were offered as design trends. Demand for classic and heritage shapes with a twist, which may have been inspired by the Baroque or Colonial eras of Western history, identifies the Colonial Chic consumer - the shopper that likes to mix and match, filling their homes with exotic plants and collections that are elegant, precious and high-end. "They like to collect things and they like to put them together. They like to have a 'social network staging' and take pictures of their house, putting them on Instagram and sharing them. It's a kind of show-off way to live," she said. Design ideas included darker and more sophisticated shades, including blue, brown and gold; exotic shapes and unusual fruit motifs; intricate details; and well-designed decorative objects. The final consumer group identified by NellyRodi for summer 2019 was an upbeat, festive one, based on instinct, visuals and rooted in creative energy. Super Solarium consumers were fascinated by experimental design, brilliant light and electric primary colours everywhere that "were a manifesto", said Ms Czermak. "They really want to mix and match... to customise and personalise their own products. They don't want to just buy something from the shop, they want to recreate and to redesign." Tribal designs, seaside motifs, recycled and up-cycled goods, the psychedelic and the 1960s were touchpoints that buyers could look to for inspiration. At a second seminar, presented on 21 April, buyers heard from WGSN, a leading global authority in trends for consumer markets. The "WGSN Presents: Lifestyles of the Future" seminar outlined four lifestyle directions that will most influence the agency's clients for the next few seasons. Leading the seminar was WGSN Senior Editor Anupreet Bhui. From the company's Hong Kong office, Ms Bhui focuses on consumer insights, marketing and product ideation. She suggested there were four "macro trends" based on emotion that are driving the agenda for consumers: Being Connected, Being Flexible, Being True and Being Well. Based on the sensation of isolation that is typified by the "Empty Nest" youth of the Chinese mainland, younger consumers want real connections, Ms Bhui said. "Now, and in the future, people are reaching out to find solutions in working, living and shopping to stay connected," Ms Bhui told the seminar. In the world of work, the rise of co-working spaces was an antidote to the isolation felt by freelancers and workers in the "gig economy". The emergence of co-living spaces was a linked phenomenon. While these shared housing arrangements were also linked to financial inequality, dormitory-style living was increasingly common in affluent, Western cities. Similarly, retailers were doing less with more by offering fewer brands in smaller spaces, and increasing the sense of exclusivity felt by consumers. In large-scale retail, the idea of community commerce - or curating a mix of chain-store and establishment brands with independent stores - was gaining traction as malls once again become hubs of community interaction. Within the home, the trend to connect includes digital communications and technology. Artificial technology will continue to evolve, Ms Bhui said, creating an ambient technology that went far beyond the auto-replenishment functions of Amazon's "Dash' buttons. "We are seeing our customers living in smaller and even smaller spaces, yet demanding more from these spaces especially great design. In the US, in 2016, for the first time since 2009, the average size of a home built went down from the prior year," she said. Energy efficiency, storage, flexible floorplans and doing less with more were all important drivers of consumer behaviour. Ori Systems combines robotics and architecture to create modular furniture that changes shape, for example, while IKEA is due to release a collection of space-saving furniture based on the research of space agencies. The flexible home was also a personalised one, where consumers wanted to express themselves - and were prepared to pay for it. Well-being is now a mainstream concept that involves the seeking out of comfort and health throughout every aspect of our lives. Retailers have incorporated the feeling of homeliness through textures and soft furnishings in creating welcoming spaces. The "mood boosting" power of colour, crystals, lighting and music were leveraged by retailers to offer wellness and unique experiences that met a consumer desire for self-improvement, said Ms Bhui. 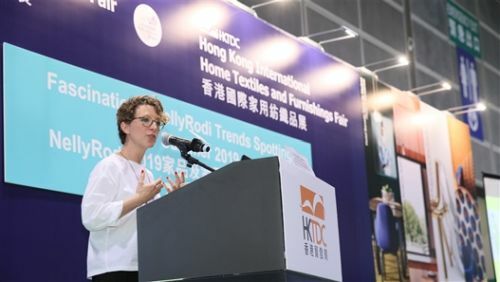 Both seminars were part of the 33rd HKTDC Hong Kong Houseware Fair, which took place alongside the ninth HKTDC Hong Kong International Home Textiles and Furnishings Fair. The two fairs brought together more than 2,600 exhibitors from 26 countries and regions. Lea Czermak, Senior Creative Project Manager for NellyRodi, identifies four groups of consumers that dominate demand. She was speaking at a seminar entitled "Fascination NellyRodi Trends Spotting for Summer 19", held on 20 April during the Houseware Fair.